The number of applications for liquefied gases is constantly increasing. Special vessels are needed not only for cryogenic storage of biological material but also for many industrial applications. Taylor-Wharton cryogenic vessels are based on the principle of complete thermal insulation. They consist of an inner vessel and an outer body separated by a stable vacuum, which virtually precludes any transfer of heat from the ambient environment to the inner vessel. Additional layers provide what is referred to as superinsulation to protect the vessel against the warming effect of infrared radiation.Taylor-Wharton cryogenic vessels are designed to hold either canisters or racks. Depending on the application the material can be stored in the liquid phase or in the vapour phase of the tank. 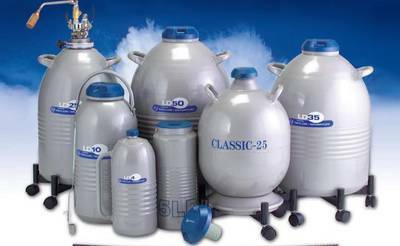 LD series dewars are used to store and distribute small amounts of liquid nitrogen. They are ideal for various applications that call for the use of this medium, for example, in the area of material testing. This series includes models with capacities ranging from 4 to 50 liters. A pitcher style model (LD4) is available for easy pouring, as well as a beaker style model (LD5) with a wide mouth to make it easier to immerse objects in the liquid nitrogen. These cylinders are transportable units built to rugged construction standards. They are designed for the low-pressure requirements of liquid nitrogen filling, storing and dispensing and feature easy, quick liquid withdrawal. These road-transportable cylinders feature automatic pressure-building and economizer circuits. Low-loss holding capabilities help conserve gas during low demand periods. 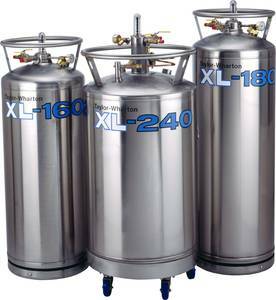 These units set the standard for liquid cylinder performance in the gas industry. for the LN2 Storage & Supply product line.